Corinthe is found in the southern-half of Elsweyr, known as Pellitine, which are known for jungles, rainforests, and river basins. In the heart of Elsweyr. The main gate in Corinthe is known for its stature, being called the Great Gate of Corinthe. The land surrounding Corinthe is open savannahs, populated by the Desert Lynx, which are totem animals of the pastoral Khajiit tribes. They are used in managing moving herds. Outside of the city outskirts is the ruins known as the Temple of Agamanus. Corinthe is the home of the First Corinthe Hussars, horsemen that utilize the Pellitine Mustang that live in the area. The Dark Brotherhood had a sanctuary in Corinthe, but it was later abandoned. 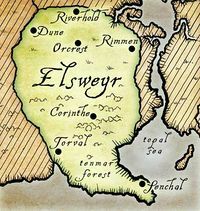 Corinthe is neighbored by several settlements, including Heimthor Mount in the west, Helkarn Land in the north, and Portneu View in the southwest. Corinthe's founding is unknown. In 2E 560, the Knahaten Flu had spread across Southern Tamriel, and it eventually made its way into Elsweyr. It began in Senchal, and it soon spread to the rest of Elsweyr, including Corinthe. The province was slowly identifying the disease and killing it. It was Clanmother Mizaba-ko of Corinthe that first identified how the flu spread between the Khajiit. Eventually, the Aldmeri Dominion had intervened and provided an abundance of aid to the struggling Khajiit people and the disease was subsiding successfully. At around 2E 582, in the Mages Guild at Corinthe, Journeyman Mora'at the Lesser had developed a theory regarding lightning in the Destruction School of magic, and how it fundamentally works. Their theory implies that shock magic is created when the user channels magic through the tapestry of matter and magicka that is the reality of Mundus. This would cause friction and subsequently, the channeling of lightning magic. During the Imperial Simulacrum in the late Third Era, the city-state of Corinth was an active settlement, being ruled by King Ak'nir. It had a rivalry with Torval. After obtaining the third piece of the Staff of Chaos in Valenwood, the Eternal Champion was brought to the province of Elsweyr, and gained the audience of the Mages Guild Loremaster in Corinth, Turamane ap' Kolthis. A few days prior, a band of knights led by Sir Galandir had raided the Mages Guild and stole an important tablet, which contains the key to deciphering an Elder Scroll. Should the champion acquire the tablet, Kolthis would give them the location of the Halls of Colossus. In the end, the champion returned the tablet and left for the Halls of Colossus. Sometime after, Necromancy had become a delicate topic amidst the Mages Guild of Tamriel. During Hannibal Traven's time as the Archmagister of the Guild, a debate was held on whether the Black Arts should be practiced and recognized by the Guild. One of the people vehemently against the practice was Magister Voth Karlyss of Corinth, while the other side was represented by Ulliceta gra-Kogg of Orsinium. In the end, Magister Karlyss' arguments proved to be successful as necromancy was outlawed. It was revealed later that Magister Kogg had practiced Necromancy. This resulted in her apprehension by the hands of Hannibal Traven and the Order of the Lamp. By 3E 432, the drug-smuggling business spearheaded by Ya'Tirrje, the Gold Cat had an operation in Corinthe, among other major-cities in the province of Elsweyr, mainly through the coastal-city of Senchal. This page was last modified on 25 February 2019, at 17:47.